Galleon is a Magnum 35’ built in 1972 that was added to the Magnum series by Apeco in 1968 who continued Aronow’s racing tradition and developed the Magnum 28’,25’ and 35’, now called the Classics. The beginning of the American high-performance, deep-vee boat started in 1958, with the first deep-vee hull, designed by Ray Hunt. The Hunt design had a 24-degree deadrise, which eliminated much of the pounding of the conventional hulls. Also the added feature of longitudinal strakes on the bottom gave added lift and threw out the spray to keep the boat dry. This 24 degree deep—vee hull is the foundation of the Magnum design and later the Cigarette boats. Cruising in a Magnum 35 is like being part of the worlds offshore racing heritage. 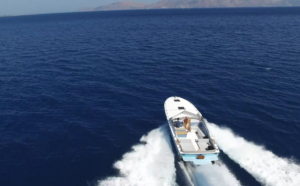 Check out this slick video of the Magnum Marine 35 Galleon in Greece, below! PreviousPrevious post:Gianni Cacace’s Magnum 80′NextNext post:Magnum Marine Store Now Offering Shirts, Jackets, Polos, and More!